Most designs you find at local retailers are boring, ordinary, common or look cheap and tacky- especially this recent craze for rectangle prints on the fronts of t-shirts which look like an uninspiring ink-jet transfer paper job. A design on shirts, any other clothing, or even tattoos on skin need to be placed properly. A top-heavy shirt with a design covering just the shoulders and chest or an a-symmetric piece of artwork can look great, but most companies just churn out the same, basic, small to medium sized square or round design slapped in the centre with no consideration to flow, composition or just trying to do something a bit different. There was no mention of shirt dimensions other than chest size on site at the time, so did a little research for "American apparel t-shirt" to get a fairly good idea of the size I'd need. Being 6'1" male, with a 40" chest and 35" waist, I went for a medium and it fit pretty well. Some sizes hinted at a large being more appropriate for me. Although I prefer a slightly tighter fit, so wonder if a 'small' (described as a 34-36" chest size) would have looked better on my frame? 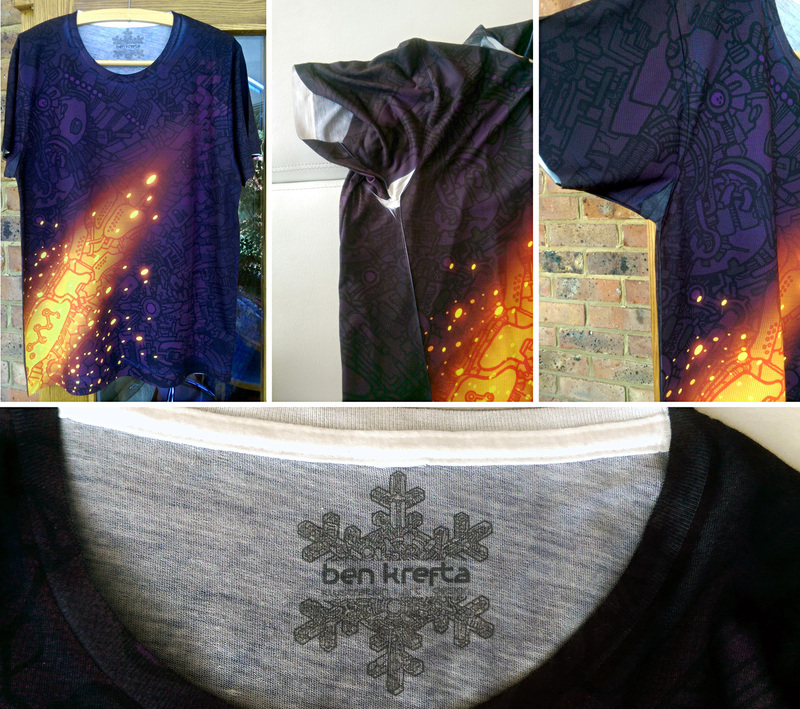 I wondered if it would be possible to find and supply your own shirts for printing to guarantee a better fit? 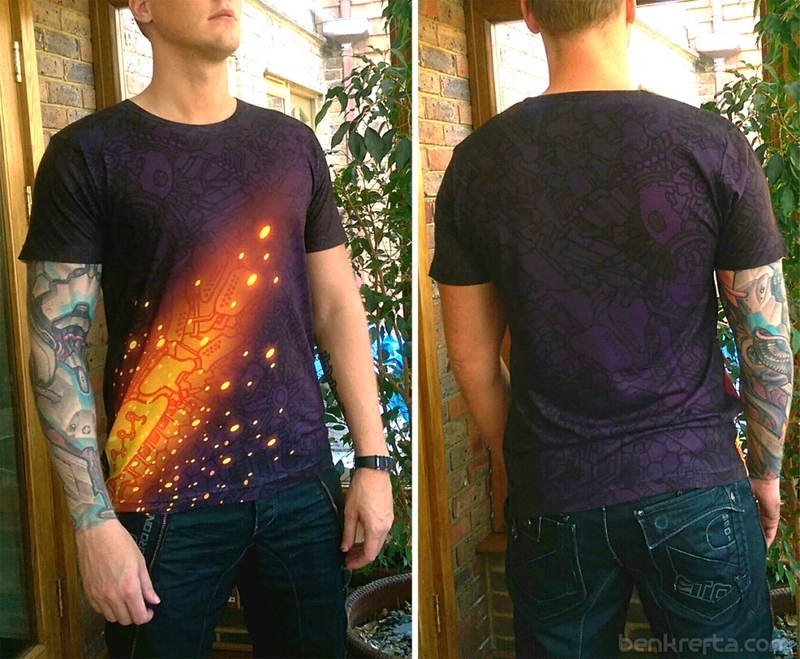 If spending over £30 for a t-shirt, you'd hope for it to fit well as well as look good. The design came out very nicely with colours nearly as vibrant as my RGB computer screen. Tonal contrast was lacking a touch in certain areas, which is worth taking into consideration when designing my next shirt. There wasn't enough contrast with the subtle greys on the inside neck logo, so would also look to make that darker for next time. Very fine lines don't show up so well- keeping things a little bigger and bolder is the way to go. The biggest problem was the inevitable white creases around the seams and armpit areas. Patches, nooks and crannies where the print doesn't reach. I knew there would be a strong possibility of this happening and they looked pretty bad if the arms were raised. I manually filled these areas with a black Sharpie, which over time fades out to a grey tone. Took some effort but now looks A LOT better than it did upon arrival, and probably not noticeable unless pointed out. I'm hoping it'll hold up in the wash. I may need to try other permanent ink or fabric markers if not. I like the idea of selling full front and back print shirt designs, but with my mark-up on top, I'm not sure people would be willing to pay £40-£50 for a single t-shirt? It may not be everyone's cup of tea, so for now I'll continue to create my own custom shirts from time to time for personal use and leave it at that. Many thanks to Sublab for providing the opportunity to try this. The shirt looks awesome!